Draft: 2011, Philadelphia Phillies, 33rd rd. Brock James Stassi (pronounced STASS-ee)...Twitter: @brockstassi28...2007 graduate of Yuba City High School (CA)...2011 graduate of the University of Nevada-Reno...named 2010 WAC Pitcher of the Year...earned 2010 All-WAC First-Team honors as a pitcher and Second-Team utility honors...selected to 2011 First-Team All-WAC as a first baseman...brother, Max, is a catcher in the Houston organization. Was an invite to Phillies spring training and made club's Opening Day roster, the first of career ... Spent two stints with Phillies: start of season-June 8 and June 20-end of July ... Made major league debut April 3 at Cincinnati, pinch-hitting, drawing a walk off Michael Lorenzen ... Recorded first major league hit April 10 vs. New York-NL, homering off Addison Reed ... Designated for release or assignment August 31; outrighted to Lehigh Valley ... Combined to hit .251 (45-for-179) with four doubles, four home runs and 23 RBI in 52 games between Phillies and IronPigs. Was an invite to Phillies spring training...spent entire season with Triple-A Lehigh Valley...led club in on-base percentage (.369) and second in doubles (26)...committed just one error in 743 total chances at first base...made four relief appearances...played for La Guaira in the Venezuelan Winter League, hitting .297 in 32 games. Spent season with Double-A Reading (Philadelphia)...named Phillies Minor League Player of the Week twice: May 11-17 and July 20-26... named Midseason and Postseason EL All-Star...named Eastern League MVP...led the EL in OPS (.863), RBI (90) & SF (10), tied for first in doubles (32), second in total bases (219), on-base percentage (.394) and walks (77), third in runs (76) and games (133), fourth in slugging percentage (.470), fifth in hits (140), seventh in average (.300) and tied for seventh in HR (15)...played for Mayaguez in the Puerto Rican Winter League and Caracas in the Venezuelan Winter League. Spent entire season with Double-A Reading (Philadelphia)...reached base safely in 23 of 27 games in May with 17 walks and a .390 on-base percentage...appeared in two games in relief, both scoreless outings, his third and fourth professional pitching appearances. Spent entire season with Single-A Clearwater (Philadelphia)...hit .300 (21-for-70) with runners in scoring position...posted a .347 on-base percentage on the season...made two pitching appearances, tossing 2.0 scoreless innings with one walk and two strikeouts. Split season between Single-A Clearwater, Single-A Lakewood and Single-A Williamsport (Philadelphia), combining to hit .243 (53-for-218) with 10 doubles, three home runs, 33 RBI and a .329 on-base percentage in 67 games. Began professional career with Single-A Williamsport (Philadelphia), playing in 50 games. March 28, 2019 1B Brock Stassi assigned to Richmond Flying Squirrels from Sacramento River Cats. March 2, 2019 1B Brock Stassi assigned to San Francisco Giants. December 31, 2018 Yaquis de Obregon placed 1B Brock Stassi on the reserve list. December 4, 2018 Yaquis de Obregon signed free agent 1B Brock Stassi. August 12, 2018 San Francisco Giants signed free agent 1B Brock Stassi to a minor league contract. August 12, 2018 1B Brock Stassi assigned to Sacramento River Cats. May 25, 2018 Rochester Red Wings released 1B Brock Stassi. May 5, 2018 Rochester Red Wings activated 1B Brock Stassi from the temporarily inactive list. May 1, 2018 Rochester Red Wings placed 1B Brock Stassi on the temporarily inactive list. December 7, 2017 Minnesota Twins signed free agent 1B Brock Stassi to a minor league contract and invited him to spring training. December 7, 2017 1B Brock Stassi assigned to Rochester Red Wings. November 21, 2017 Charros de Jalisco placed LF Brock Stassi on the reserve list. November 6, 2017 1B Brock Stassi elected free agency. October 10, 2017 LF Brock Stassi assigned to Charros de Jalisco. September 3, 2017 Philadelphia Phillies sent 1B Brock Stassi outright to Lehigh Valley IronPigs. August 31, 2017 Philadelphia Phillies designated 1B Brock Stassi for assignment. July 21, 2017 Philadelphia Phillies optioned 1B Brock Stassi to Lehigh Valley IronPigs. 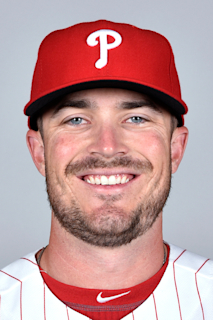 June 20, 2017 Philadelphia Phillies recalled Brock Stassi from Lehigh Valley IronPigs. June 8, 2017 1B Brock Stassi assigned to Lehigh Valley IronPigs from Reading Fightin Phils. June 5, 2017 Philadelphia Phillies optioned 1B Brock Stassi to Reading Fightin Phils. March 31, 2017 Philadelphia Phillies selected the contract of Brock Stassi from Lehigh Valley IronPigs. January 11, 2017 Philadelphia Phillies invited non-roster 1B Brock Stassi to spring training. October 5, 2016 1B Brock Stassi assigned to Tiburones de La Guaira. April 2, 2016 1B Brock Stassi assigned to Lehigh Valley IronPigs from Reading Fightin Phils. January 6, 2016 Philadelphia Phillies invited non-roster 1B Brock Stassi to spring training. November 28, 2015 1B Brock Stassi assigned to Leones del Caracas. October 29, 2015 Indios de Mayaguez released 1B Brock Stassi. October 29, 2015 1B Brock Stassi assigned to Indios de Mayaguez. October 29, 2015 1B Brock Stassi roster status changed by Indios de Mayaguez. March 30, 2014 1B Brock Stassi assigned to Reading Fightin Phils from Clearwater Threshers. April 3, 2013 1B Brock Stassi assigned to Clearwater Threshers from Lakewood BlueClaws. June 23, 2012 Brock Stassi assigned to Lakewood BlueClaws from Williamsport Crosscutters. April 28, 2012 Brock Stassi assigned to Clearwater Threshers from Williamsport Crosscutters. June 15, 2011 Brock Stassi assigned to Williamsport Crosscutters. June 11, 2011 Philadelphia Phillies signed OF Brock Stassi.